A recent research project undertaken by a Cardiology Team in Aut Even Hospital and Eagle Lodge Cardiology was presented at the Euroecho conference in Berlin. A commendation was awarded for this project. Well done to all involved. Vortex rings are formed by the mitral orifice. A large left ventricle can accommodate the full size of the vortex ring it generates, but large left ventricles due to disease ( cardiomyopathy) have high wall tension which causes energy waste and the vortex collapses so the vortex formation time is short. If the chamber is too small it cannot accommodate full vortex ring formation, and is therefore incompatible with efficient filling which also leads to a short vortex formation time. In normal sedentary individuals the vortex formation is adequate and therefore the optimal vortex formation time may not be reached although the vortex ring is adequate for filling. 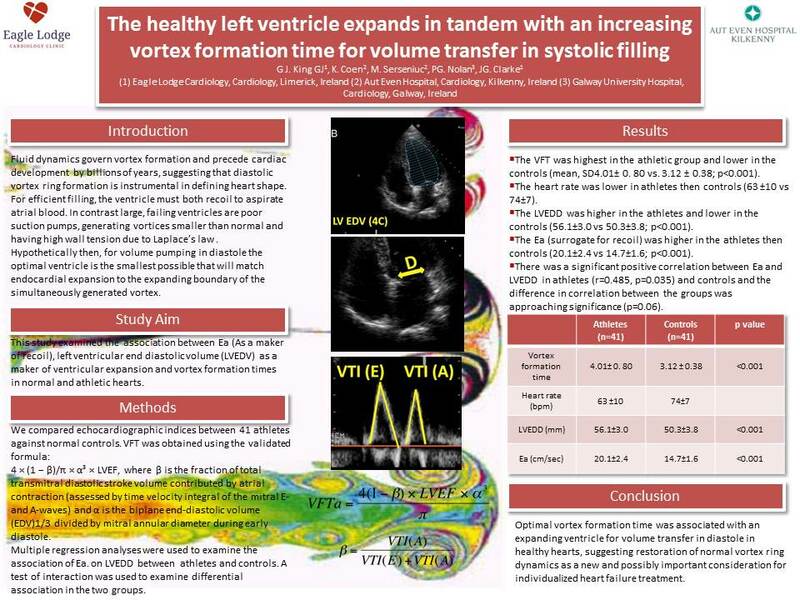 A fully optimized left ventricle however enables energy-efficient filling by matching endocardial expansion to vortex ring formation and expansion, and maintains low wall tension. We have shown therefore that the athletic large left ventricle accommodates the full vortex ring formation to an optimal level and at a larger but optimal vortex formation time. If some process was found to restore vortex ring dynamics to a failing heart this would have implications for heart failure treatment.